Shop from a range of bed pads that instantly absorb liquid during the night giving you complete peace of mind. Some bed pads feature tuck in flaps in order to position the pad securely, alternatively there are bed pads available without flaps for users wanting to protect only one side of the bed. Versatile by design, bed pads can be used both on top or underneath the mattress cover depending on your preference. 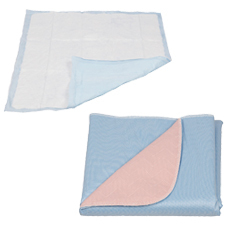 The range feature different absorbency levels depending on the needs of the user and can be washable or disposable.